Detroit Lions: The Unluckiest Team in the NFL? Looking at their record, the Detroit Lions have been the worst performing team in the NFL in terms of wins for some time now. They set a record in 2008 as the first team in NFL history to lose all 16 regular season games. In 2009 Jim Schwartz joined the team with an almost entirely new coaching staff, and still the Lions went 2-14. The Lions kicked off the 2010 season with an unbelievably close loss to the Chicago Bears. Very late in the game quarterback Shaun Hill completed a 25-yard touchdown to wide receiver Calvin Johnson that would have pushed the Lions into the lead. Although a touchdown was initially signaled and put on the scoreboard, referees met to review the play and deemed it an incomplete pass due to the catch not being completed during the process of the catch. The following week the Philadelphia Eagles met the Lions in Detroit for their home opener, another extremely close loss by three points when they completed an onside kick towards the end of the fourth quarter and turned the ball over on downs. Looking at the Lions’ two wins of the season, shows a team that has athletic ability and promise, contrary to what they’ve shown in their numerous losses for the past few seasons. In Week 5 the Lions demolished the St. Louis Rams in Detroit, shutting out the defense and the offense scoring an impressive 44 points highlighted by a 42-yard interception return by Alphonso Smith. When the Washington Redskins arrived in Detroit on Halloween in Week 8 with McNabb on the bench, the Lions attacked, managing a surprising victory 35-27. 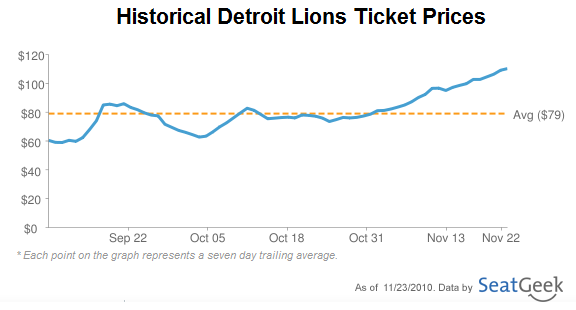 Last week, The Wall Street Journal deemed the Lions no longer the worst team in the NFL but now, the unluckiest team. Pointing out all of the Lions’ close losses, and adding up their scored points, Michael David Smith concludes that the Lions have actually outscored their opponents in all games this season. Are the Lions making a comeback? Now that Jim Schwartz and his coaching staff is fully integrated into the team, we’re seeing the Lions fighting harder than ever to rectify their record of past seasons. 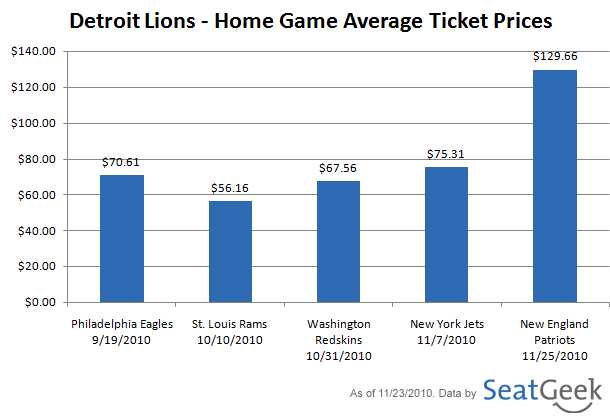 As shown in the data, fans appear to have a restored confidence in the team, with ticket prices at home steadily rising leading up to the Thanksgiving Classic game against the Patriots tomorrow. Do you think the Lions have a chance at making a name for themselves in the coming seasons? Let us know in the comments or on Twitter @SeatGeek.